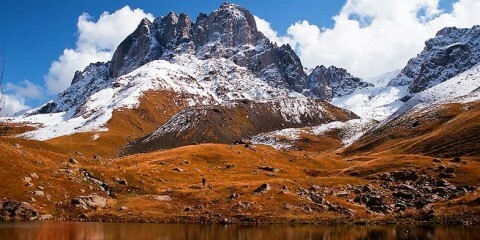 Racha region is one of the most beautiful regions of Georgia, with 3 parts: lower, upper and mountain Racha. Lower Racha — is famous with its wonderful and hospitable people, great wine, forested & water abundant nature, place to live and enjoy life. 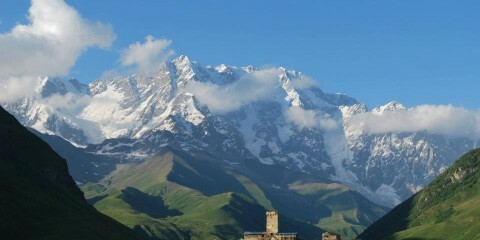 Upper Racha —- (beyond Tsesi/Uravi villages, mainly Oni district) could be quite interesting for foreign tourists with higher villages – but main Caucasus range is still not as near, while Shoda-Kedela (summits of 3300-3600m) range is seen perfectly from everywhere. Mountainous Racha—- is just between the main range (higher than 4,000) and Shoda-Kedela range so its must see if you have more than one day in Racha. 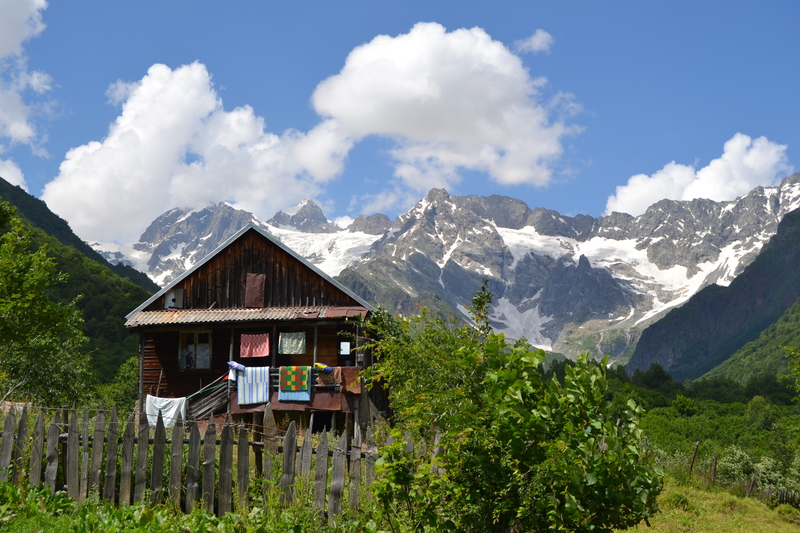 Mountain Racha is the best for trekking and hiking, mainly 2 gorges and villages : the one of resort Shovi from where you can do most impressive hike of Georgia and also Village Ghebi in the district of Oni. 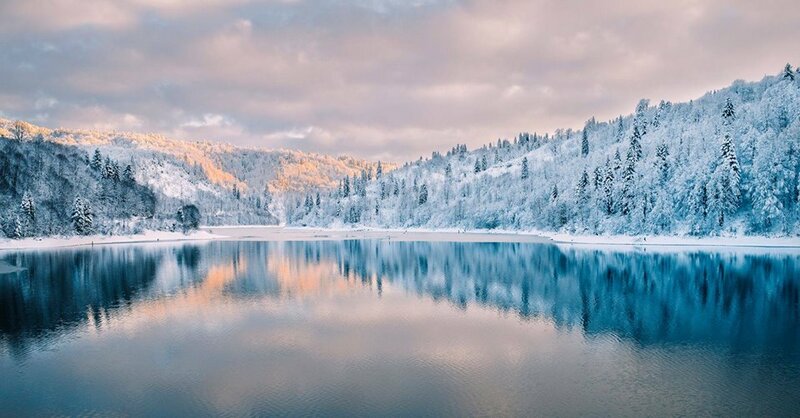 Best jeep routes to see the beauty of Racha Mt Caucasus range are: Notsara and Gona village which are both near Ghebi village, also with passes from border you can do glacier trips from Shovi resort. But If you plan just jeeproutes or dayhikes in the main Caucasus, then the best idea is to travel to Oni and make it as a base. Oni (as well as Ambrolauri, but not villages) has some really nice homestays, has so called local geyser (mineral water source flowing out which is so far public and accessible for all, its said to be perfect to shower your face and eyes with it. Oni also has several rivers flowing around it, nice and surprisingly flat terrain (great for biking) with beautiful views to Shoda-kedela range, paved road towards Shovi and Utsera resorts which are fast accessible destinations in mountain Racha and it also has more than century old Jewish Synagogue. I would say that its one of the most charming small towns in Georgia, perfect for those looking for non-touristic places. Sinagogue itself, built in 1895 with funding of Nathaniel Rotschild and Alfred Nobel (copy of Warsaw synagogue), has a nice story how it survived communist destroying all religious buildings in Racha – local Jewish women with newborn babies locked up themselves in it and Georgians also surrounded with newborn babies as a shield. Local Jewish community which was one of the largest in Georgia left to Israel in 1990s. Ambroulauri (Lower Racha) has a role as a wine route. 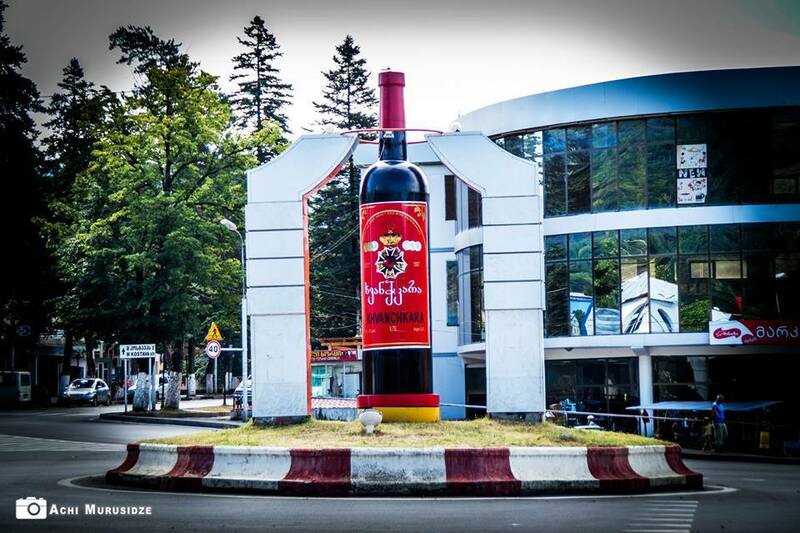 In Ambrolauri town center Khvanchkara bottle (famous semi-sweet red wine, regarded as Stalin’s favorite) stands. Its possible to organize wine tasting and dinner in Ambrolauri area including village Khvanchkara, there are some nice wineries (including Chateau Dio) in the area. Generally the region lacks infrastructure and tourist services are not well developed. Lower Racha also offers some other routes of this type which will remind you childhood. Village Skhvava where you can see perfect example of ordinary village which gets full of people in summer but empty in winter, has a ,,fridge” cave, ruins of fortress and an enjoying walk from Krikhi historical church to the source of coldest and purest Krikhula river. Tkhmori waterfall (Shareula waterfall) can be a natural shower (,,Sabanao” – place to take a bath in nature) for those who want to feel nature, while Znakva’s waterfall Tsivtskala (coldwater) is more like ,,drinking place – sakeifo” – Georgian characterization of nature party infrastructure. 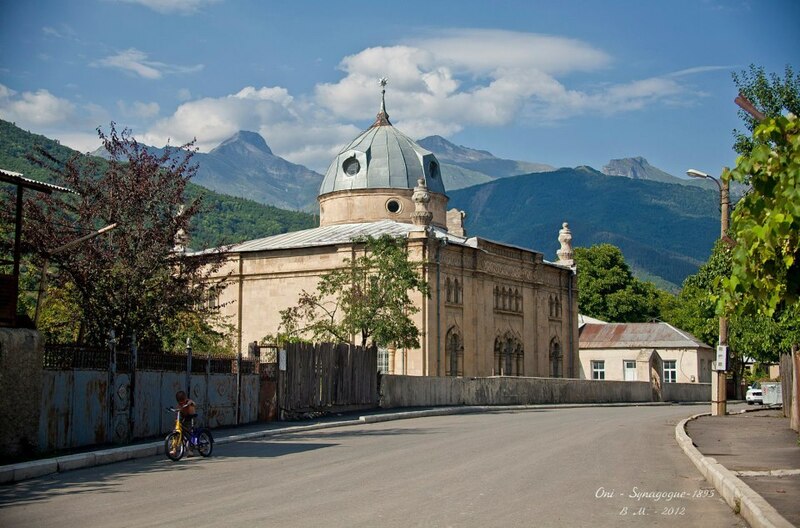 Passing through cold springs of Lomoido where local youth gather to play cards, you can make it over Upper Chkvishi village’s prominent Labechina church to enjoy views of Racha and Lechkhumi mountains. All those listed in this paragraph are NOT must see places, not so exotic, but if my dear reader wants to get if right I will say that its the LIFE. 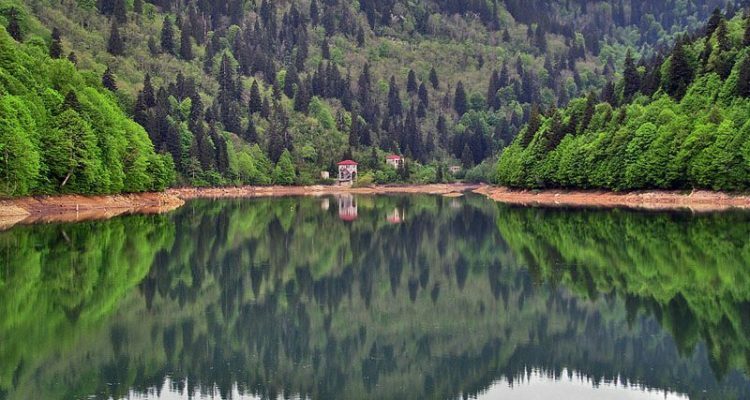 The first landmark when you enter by sedan/jeep in lower Racha is all season beautiful lake – Shaori Reservoir. 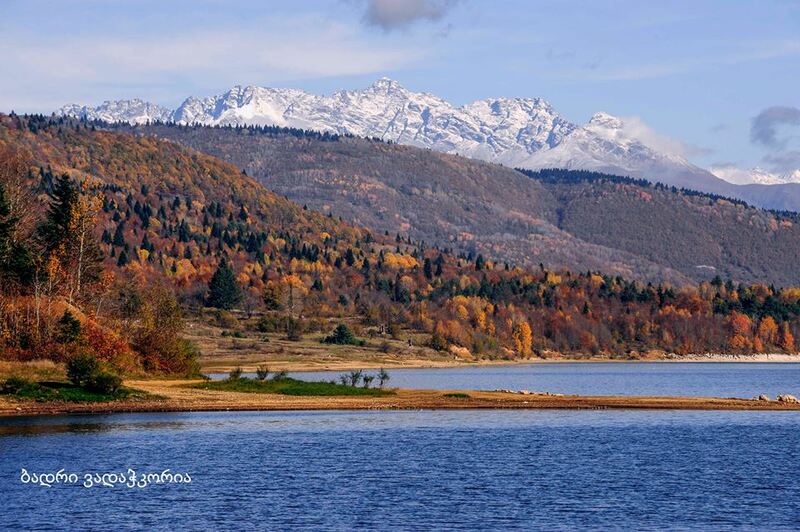 Its the largest lake of the region with its special micro-climate – Always cooler in summer, snowed and often frozen in winter; Thanks to mixed forests, its very impressive especially during autumn colors when the surrounding colorful forests are reflected in the lake, and in winter after fresh snow, also when its great visibility in winter/autumn and you can see double views of snowed Caucasus summits. Usual perfect stop for barbeque/picnic, relaxation in summer, fishing, as well as camping. Before, making to to Shaori Racha trip could include Nine crosses hike and Dzevri cave as well which are on the way. 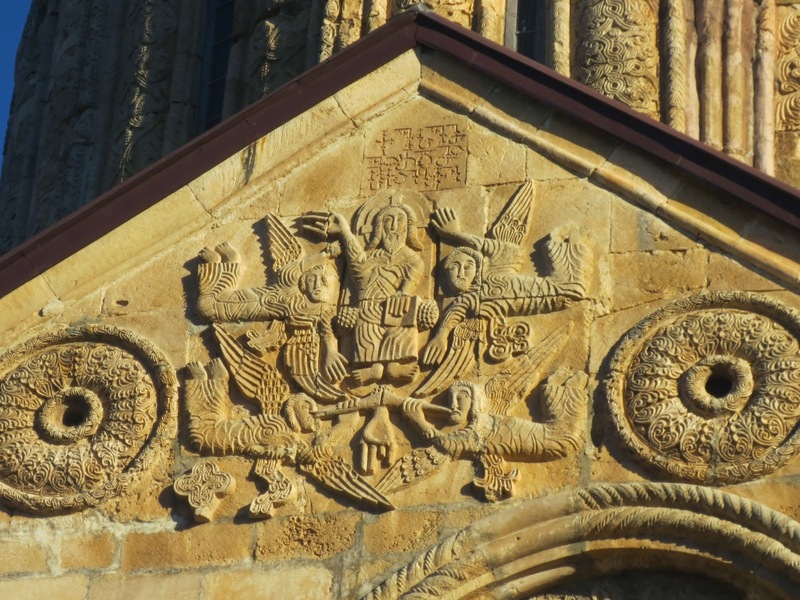 Nikortsminda Cathedral (built in 1010-1014) is symbol of the golden age of Georgian architecture, with its unique facade decorations, bareliefs from the 11th century and 15th century paintings depicting noblemen of Racha and Imereti from those times. 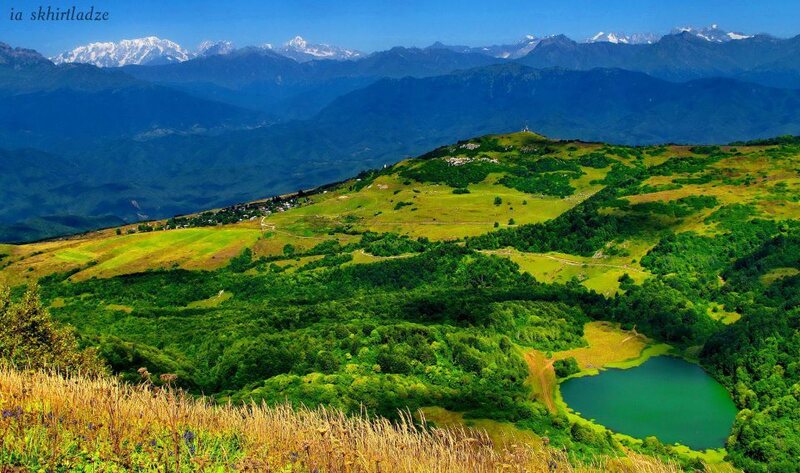 Nikortsminda is just minutes drive from Shaori lake. From Nikortsminda you can reach the next destination(s) which require a little effort. Udabno (Chelishi) Ruins and Shareula River source– is a pleasant walk from Nikortsminda (just few kilometers 2-3) in wonderful nature. Cold mountain river in deep forest, place for picpic and just heavenly rest in summer, also water dam where you can swim. Besides ruins of old monastery you can see the source of Shareula river as it disappears in the cave. In addition to all these, within 300m radius you can visit one more cave called Sakinule (,,fridge”) where its considerably lower temperature than outside. So its nice destination for summer. Mravaldzali St.George Church (upper Racha) could be one interesting place if you are on a jeeptour. 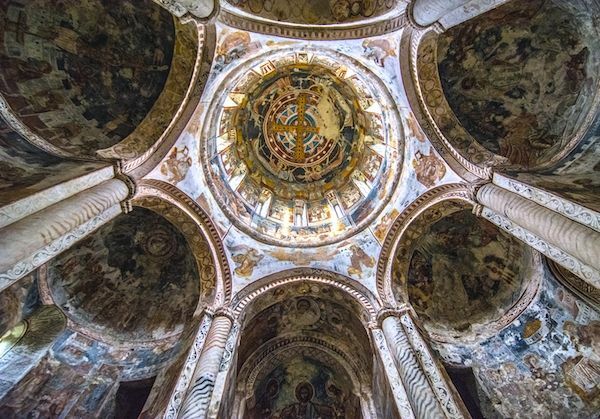 Its the place from where you can see all the nearby holy places – Like Labechina in lower Racha and Khvamli mountain in Lechkhumi, Svaneti summits if its good visibility, Shoda-Kedela range of Caucasus, towns of Oni and Ambrolauri and surrounding villages. Church is in white, especially beautiful off season (winter). You can take photo with monument of World War 2’s hero – local horse called Iuda which used to fight in North Caucasus against Nazis. Besides, Mravaldzali has tombstone of famous Tamada (toastmaster) from Racha – Simonika Skhirtladze (Oni’s main high school is named after him). Historically, Mravaldzali was admired by Muslim conquerors (in old times conquest was some type of tourism). 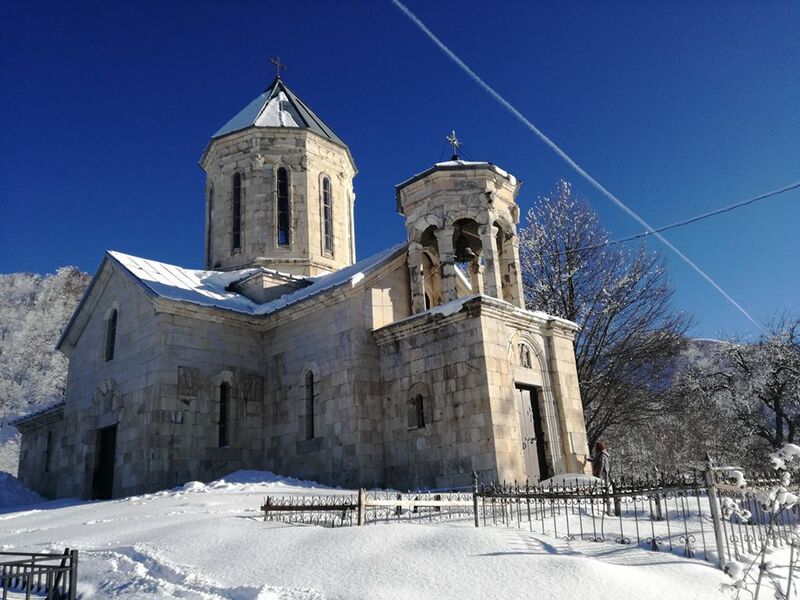 First, Ottoman Turkish soldiers who were stuck in the mountains of Racha and could not move/had problems due to fog asked St.George of Mravaldzali for help and promised him not to touch anyone in the distance of the church’s bell ringing and fog disappeared. They gave it Georgian name which is translated as ,,all powers”. Besides, Shah of Iran – Abbas I the great send his own sword as a gift to Mravaldzali and it was kept there till Soviet times. Shkmeri village is a perfect and more interesting alternative to Mravaldzali, but I will discuss it in the separate article. 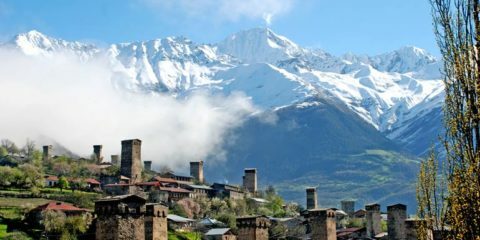 Alternative road to return to Kutaisi via Tsageri town offers lots of roadtrip destinations, which will be discussed in separate article. How to get to Racha by public transport– If you just want to make it to Oni or Ambrolauri, you can take marshutka from Tbilisi (didube metro, station Okriba 8-9am, cost 20 gel +-), arrives at 2pm +-. 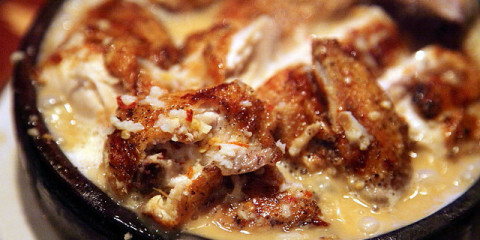 Or you can take marshutka from Kutaisi. From Kutaisi there are 2 roads, marshutkas taking short road via Ambrolauri-Tkibuli need 2.5- 3hr to get to Racha and leave everyday 4pm from Kutaisi – Chavchavadze st, Station Okriba and arrive in Oni at 6.30-7pm (in Ambrolauri 30 min earlier); and from Oni the same marshutkas leave at 9.30am. marshutkas taking long road road through lechkhumi villages (Tvishi, Alpana) leave at 9am from Kutaisi (station Javchis khidi – Chain bridge) and arrive in Oni at 1.30-2pm passing through the whole Rioni gorge up. The same marshutkas leave Oni at 3pm. Time difference between Oni and Ambrolauri is about 30 minutes drive. You may also find shared taxis in Tbilisi, didube station for 30 gel+- per person. Please note that public transport rides may involve stops mid-way for lunch at doubtful places and considerably fast driving in Georgian style. In terms of meeting local people, only Kutaisi-Oni/Ambrolauri buses which pass through Lechkhumi villages may be interesting. Hi! Is it ok to drive there with Ford escape ourselves? How’s the road condition. Ford Escape SUV 4X4 should be fine for most places, other than Gona village and Notsara jeep tour for which better to hire local car or hike; Other than this for most sights of Racha its fine. Road condition is great. Just a few serpentines. Otherwise till Shovi resort from Tbilisi via Tkibuli its asphalted. From Kutaisi better use Gelati-Tkibuli road again. your article and map are so helpful!! thank you so much. i am struggling to build a 2 day route for us from Tbilisi. we are looking into sightseeing and walking but not hard trekking due to medical issues.